UCMP helps PIN celebrate 70 years! The Paleontological Institute of the Russian Academy of Sciences in Moscow (PIN) celebrated its 70th anniversary on October 19 and 20, 2000. With a long history of collaborations and as a Partner in Paleontology with PIN, UCMP was invited to join in the festivities and was represented by Dr. Jere Lipps. 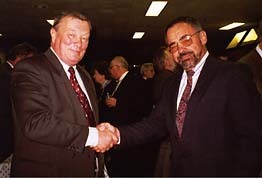 PIN Director A. Rozanov (left) is congratulated by UCMPs Jere Lipps. that include a truly fantastic Paleontological Museum in Moscow, thousands of papers and over 500 books published, world-wide exhibitions, university student instruction, and international collaborations. Such a fine record attracted important guests from Russia, Mongolia and many Russian Institutes were representedGeology, Biology and others, as well as the Mongolian Center for Paleontology and UCMP. The celebration included a series of international keynote speakers from several of these places, including Jere who spoke on the earliest protists. A photo display going back to the beginnings of the Institute showed field activities throughout the world, including more recent cosponsored trips to the White Sea with UCMP and UREP (University Research Expeditions Program). UCMP presented a plaque honoring PIN to Director Rozanov. Note: PIN and UCMP entered into a formal cooperative exchange program in 1993 to support student and professional research exchanges and collaborations.